I think the mitten palms are wrong, but the main thing that caught my eye is when they lace up the mail chausses. The lacing seems to be attached to the chausses, not the gambeson, and seems to be pulled through holes in the gambeson, and tied on the outside. 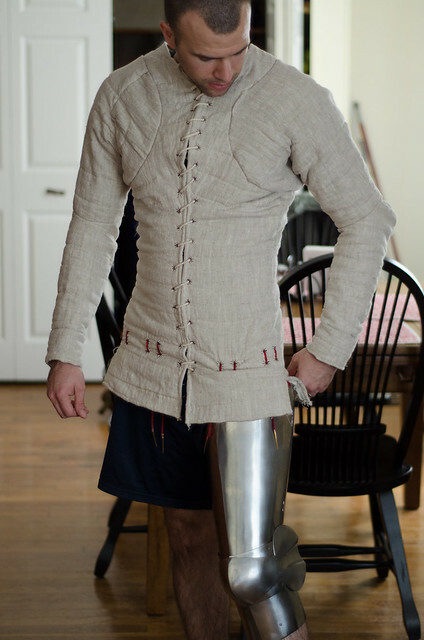 This lets them sit inside, against the body, which is mostly how Sir Ian points his legs (and I want to change mine to when I get a new arming coat for next season). However, with these tying on the outside, instead of inside, it seems they might be easier to tie / adjust. It doesn't have any reinforcing leather, but with the lacing being attached to chausses, it may already be through leather on there; maybe the gambeson doesn't need leather too? I know functionally they will work exactly the same. But is it period correct to tie on the outside vs inside? Functionally it is not exactly the same. If the upper body garment you are pointing to is long, and has a skirt or peplum like most arming garments pre-15th century, then you will likely want to point from the inside. If you point to the outside of a long upper body garment it will bunch up under your leg harness which should be closely fitted to your upper thigh. You can imagine on his gambeson, or my doublet, if we pointed to the outside it would sandwich all the layers of quilted garment under our leg harness, but over our leg, causing all kinds of awkward bunching and interference. Pointing to the outside will work on a short 15th century style doublet because there's no bulk from the waist down as in earlier garments interfering with fit at the thigh. Then again, there is no evidence for pointing to a doublet before the middle of the 15th century anyway. All references to mail chausses are described as suspended from something akin to a lendener, strap, girdle, loin belt etc. 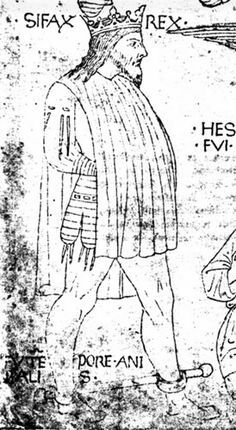 Also, mail legs from the 12th century should probably be 'lace up the back', not stockings, as stocking style mail legs don't become common in artwork until after 1250. Your cuisses are on the inside, and also tied on the inside (no visible knots on the outside). The lacing starts from the arming garment, and goes through the legs. In this video, starting at 0:26 to 0:32, he has the lacing attached to the leather on the cuisse, and feeds that through holes in the gambeson, leaving the knots on the outside, but with the leg armor closest to the body, and gambeson outside. In this case, starting on the legs, and going through the arming garment. What I'm wondering, from a historical standpoint, is there anything that says where the knot would actually be? And/or if the lacing is attached to the arming garment, or the arming tabs on the armor itself? I know it's a very minor, and odd detail, but for some reason I'm really curious about it since I am re-evaluating how I suspend my leg harness for next season / new arming garments. The first is an image of King Syphax, after he was taken prisoner. The points appear to be configured the way I wear mine on the CdB doublet. Laced to point and tie on the inside (the image shows 2 eyelets per point instead of 4 like I'm using, but same principle). Note that the peplum of his doublet is of medium length. 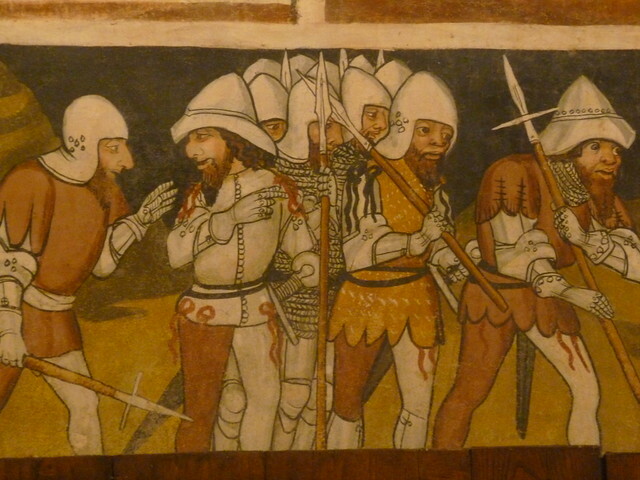 The second shows men in various stages of donning armor. The guys without cuisses on have points hanging from their doublet. The guy with the kettle hat, left of center appears to have knots on the outside. Everyone else is too armed to see. I also think the palms are wrong. not only do they seem very open, but I suppose if he fits his hands into the padding like mittens; Well they are rectangular, which would seem to me uncomfortable for the hand, or just unneccesary. Another thing that caught my eye is that he puts a sort of padded surcoat over his hauberk. Ive never seen that before, but he says it is based on King Sverre at the battle of Oswald. So perhaps that is mentioned? I will have to look into it. I think his surcoat is too short for early 13th century. I wonder about the cheek plates attached to his kettle.